0 Comment September 25, 2018 Like? Our new Sony VISCA over IP PTZ joystick is here! The much anticipated third-generation PTZOptics Pan Tilt Zoom joystick controller now features complete integration with the SONY VISCA over IP protocol. 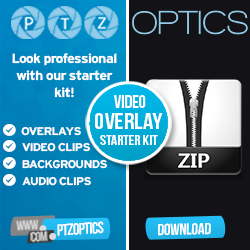 PTZOptics has completely redesigned once again they’re popular IP PTZ joystick which still includes the highly requested PoE (Power Over Ethernet) Support. The new joystick now includes advanced features for Pan, Tilt, Zoom controls which includes individual speeds that match the unique settings inside PTZOptics cameras. The joystick also includes complete integration with PTZOptics cameras and functionality such as access to the on-screen display menu, focus lock and much more. The most important feature with the new third-generation IP joystick is the reduced latency. Using Sony VSCO over IP latency is effectively eliminating. This is the perfect IP-based joystick for professional video applications it also includes six camera switching hotkeys to quickly switch between multiple cameras in your video production. This joystick was designed to make PTZ camera control easy enough for volunteers and advanced enough for broadcast professionals. The video below includes a complete setup guide and demonstrates most of the functionalities of the third generation IP joystick. Step 1 – When you first receive your PT-JOY-G3, the first thing you should do is read the included manual. Step 2 – Once you have read the manual, you can connect your IP joystick to your network. If your network switch provides PoE power, you should not plug in the included power supply. If the network switch is not capable of supplying PoE power than you should use the included power supply. Step 3 – Please NOTE: DHCP is required for initial configuration of your joystick. The joystick controller is unable to span subnets; the IP camera and joystick controller must be in the same subnet of the LAN (example – 192.168.1.123 & 192.168.1.111 belong to the same subnet; 192.168.1.123 & 192.168.0.125 do not). Step 4 – Once the joystick boot up process is complete the LCD Screen will display the controllers current IP address. Please take note of this IP address. If you would like to change the joystick language or set a static IP address for the joystick, please follow the detailed instructions in the user manual. Step 6 – Let’s quickly add two cameras to the joystick controller. Step 7 – Once the joystick has been configured for each of your cameras you can quickly switch between them using the “CAM 1-6” buttons. Note: If the LCD displays “Username or Password Error”, please check that the added device’s user name and password have been added in that device’s configuration. Note: Press the “ESC” key to return to the top LCD menu at any time. Note: The “LINK” LED on rear of keyboard will illuminate green any time a camera is successfully connected to. Step 8 – Once connected to our selected camera we can use the joystick controller for intuitive pan, tilt and zoom operation. The PTZ Speed can be adjusted by pressing the “Speed” button. You can manually adjust focus and iris using the “Focus +/-” and “Iris +/-” buttons. When taking manual control of focus and iris you will need to make sure to press the “Manual Exposure” and “Manual Focus” buttons. To return to auto focus and auto exposure simply press these corresponding buttons. Step 9 – Finally, there is a new feature on this joystick for Focus Lock. You can use this feature by pressing the “A.Focus Lock” key to lock or “A.Focus Unlock” to unlock focus. When the focus is “locked” only manual focus adjustments can be made to the current focus state. Keep in mind that if you save a preset with the camera in a manual focus state and with the focus set manually that the focus state will be saved with the preset. Step 10 – Now it is time to setup presets. Once you are connected to your selected camera you can press the “Set” button. Once you are in set mode you can move the camera to a PTZ position, selected the number preset you want and press enter. You can continue to do this with multiple PTZ positions, saving each to their unique preset number. We highly suggest keeping a notebook or laminated piece of paper next to your joystick for reference. TIP: To quickly set a camera preset you can simply hold down a numeric key for 3 seconds. Once the key flashes on the LCD screen you will have successfully set a camera preset. Step 11 – To recall presets you can click the “CALL” button. Using the keypad you can select the number you would like and then press enter. TIP: To quickly recall a saved preset simply tap the numeric key to recall that preset at any time. Step 12 – For troubleshooting your joystick please reference our user manual on page 17 which offers solutions to common troubleshooting issues.